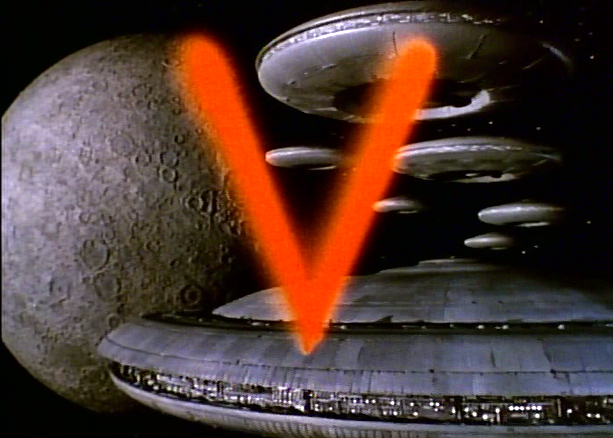 “Dreadnought,” the second episode of V: The Series (1984 – 1985) completes “Liberation Day’s” task of re-introducing the Visitor threat to Earth, and also introduces important new characters to the franchise. In this case, “Liberation Day” adds the wonderful June Chadwick as Lydia, a haughty Visitor officer who contends for Diana’s throne, or rather her command. Chadwick immediately brings authority -- and attitude -- to her performance. 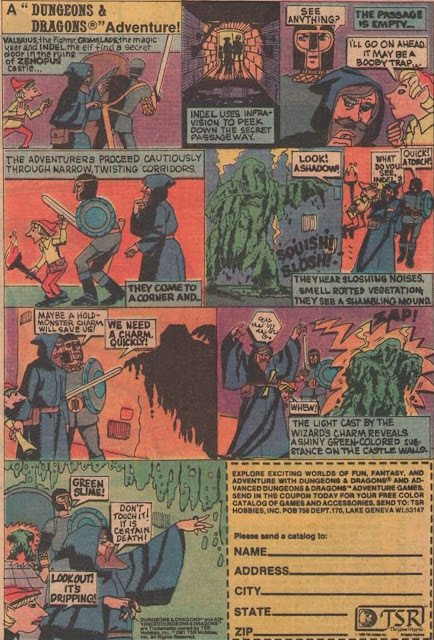 The episode also ties off some dangling plot threads. The captured mothership is destroyed, Robert Maxwell (Michael Durrell) dies a hero, and Nathan Bates (Lane Smith) imposes an “Open City” policy on Los Angeles so that personalities from the Visitor and Resistance camps can meet one another in the series without opening fire. Finally, Elizabeth completes her metamorphosis, becoming an attractive twenty-something year old (Jennifer Cooke). In charting Elizabeth’s development, “Dreadnought” also introduces a Visitor cult or religion. Willie (Robert Englund) discusses “The Mark of Xon” and the “Lords of Light" in the story, as well as person called "Amann." Like last week’s entry, it’s clear that V: The Series’ biggest stumbling block at this juncture is the sheer cost per episode. The series features a large cast, many elaborate sets, and requires new special effects visualizations on a regular basis. 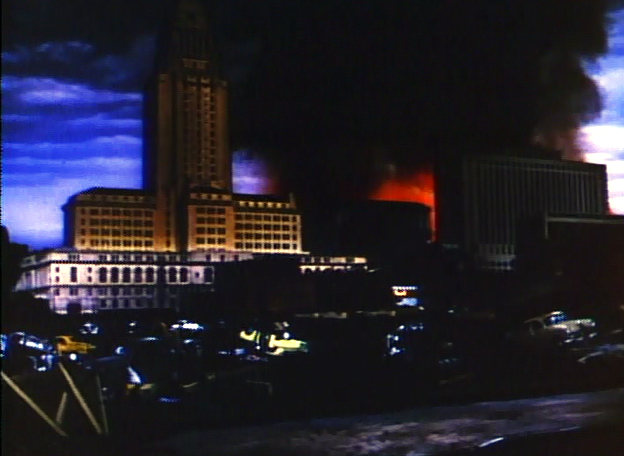 Here, we get even more stock footage from V (1983), the original mini-series, and, oddly enough, recycled footage from George Pal’s War of the Worlds (1953). 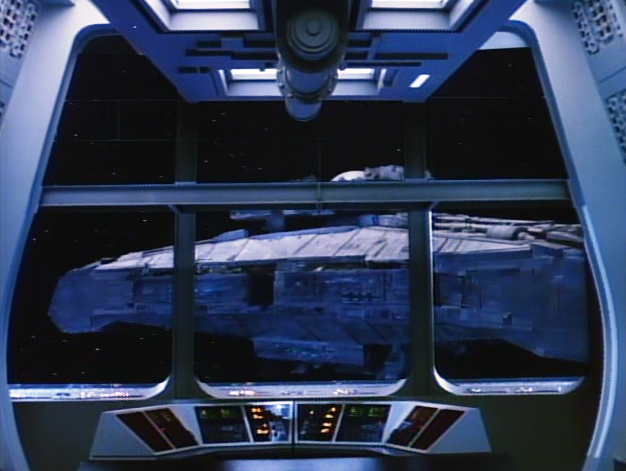 On the plus side, we also get to see a new Visitor ship, the "particle beam Triax," and the special effects involving it (and its destruction of a moon of Jupiter...) are very good. 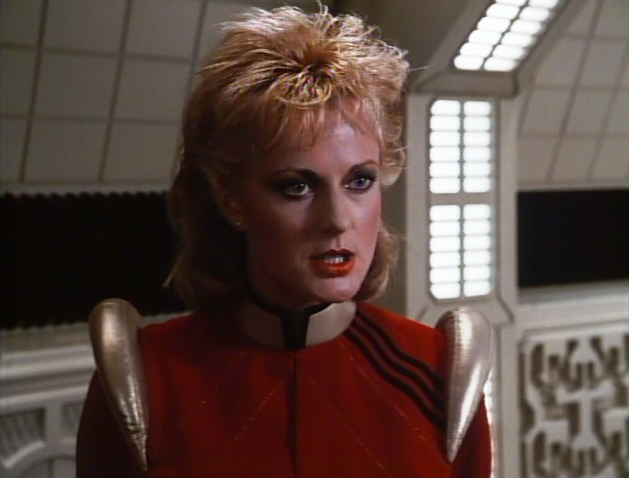 In “Dreadnought,” Diana (Jane Badler) returns to the Visitor fleet and meets her new second-in-command, Lydia (June Chadwick). Diana immediately orders an attack on Earth and “expects” total victory in the task. Meanwhile, she sends out a garrison to capture and retrieve Elizabeth, the Star Child. On Earth, humanity faces all-out war with the Visitors. In some terrestrial locations, the Red Dust toxin has died, leaving the Visitors with a clear path to occupation. In other regions, namely cold ones, the Red Dust remains as dangerous to Visitor physiology as ever. Nathan Bates, meanwhile, reveals that he will release storage containers full of Red Dust if Diana attacks Los Angeles, an act that would make the city uninhabitable by the aliens. He assembles a provisional government and promises the people that he will administer an "Open City" policy with fairness. But the truth is somewhat grimmer for the humans than Bates has let on. The Red Dust actually causes sterility in Earth mammals, including humans, and Earth is already at “the threshold.” Bates’ threat is an empty one, and he knows it…but Diana does not. Hoping to destroy Bates and his Red Dust facilities, Diana diverts a Visitor doomsday weapon from the space shipping lanes...without permission. 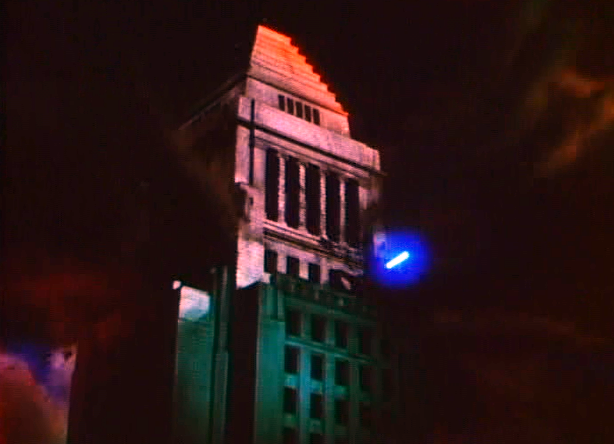 In a matter of hours, the “particle beam” Triax will arrive in Earth orbit and reduce Los Angeles to ashes. When the Resistance learns of this plot, Mike (Marc Singer), Maxwell (Durrell) and a now-mature Elizabeth (Cooke) commandeer the captured mothership and plot a collision course for the Triax. Here, the series’ makers simply had no way to afford a full-scale, global war on a small budget, and so re-purposed War of the Worlds footage to showcase such a thing. From that George Pal movie, we now see the Visitors -- instead of Martian War Machines -- pulping Earth cities, starting fires, and firing weaponry. It all looks relatively convincing and expensive, unless, of course, you happen to have a familiarity with the 1953 film. Similarly, the shots of humans throwing home-made bombs into the parked Visitor fighter come from the V miniseries. Already, the series is relying very heavily on the expedient of stock footage, a fact which reveals how expensive it was to create a new story on the expansive canvas the two mini-series established, and made so effortless appearing. Some of the writing in “Dreadnought” is a notch-down even from “Liberation Day.” For example, two assassins working for Nathan Bates, but dressed as police and riding in a police car, open fire on Donovan ( Marc Singer). He has no reason to suspect that they are not real police officers and yet, without a word, he returns fire with his Uzi right before the extended car chase. First...yeah it’s sad that the franchise has degenerated to car chases. From It Can't Happen Here to The A-Team in less than two years. And secondly, Donovan would be well-aware that by shooting at the police he is essentially murdering innocent men doing their jobs. In the mini-series, one of the resistance fighters was a former policeman, even. As audience members, we know the cops are fake, but Donovan doesn’t, and so it seems out of character for the heroic character just to open up on the LAPD with an automatic weapon. Similarly, Juliet’s (Faye Grant) line -- or variation thereof -- regarding Elizabeth, is getting silly. “It must be her alien chemistry” is being asked to cover for a whole lot of dodgy material. Such as: why did Elizabeth’s skin, during her transformation turn scaly, only to be normal again at completion of the process? Or, why did her aging accelerate in the first place, and could it happen again? And why can’t Elizabeth speak, since she was able to speak as a child? The answers we get aren't always entirely satisfactory. “It must be her alien chemistry” covers a whole cornucopia of writer’s sins, and if there’s one aspect of V: The Series that I truly dislike it is the treatment of the Star Child. She was a bad idea to start with, in V: The Final Battle -- a deus ex machina in the worst sense -- but in the series almost all of the scenes involving Elizabeth are even more dreadful and poorly conceived. As bad as all this material truly is, the drama involving Nathan Bates is actually pretty strong. He negotiates an Open City for Los Angeles, which is a necessity for the series if it is not to concern all-out war, Furthermore, his revelation of the Red Dust’s environmental impact is moving and powerful. V: The Series may not always be great, but the slippery Nathan Bates is a brilliant addition to the dramatis personae. I also appreciate "Dreadnought's" acknowledgment that the Visitors have their reasons for war. "We need this world for our survival," Lydia stresses to Diana, and that's a good point. Lydia's words re-assert the motive for the Visitors' villainy. These aliens are not merely evil -- they are trying to survive -- and I'm glad "Dreadnought" thought to include this reminder. 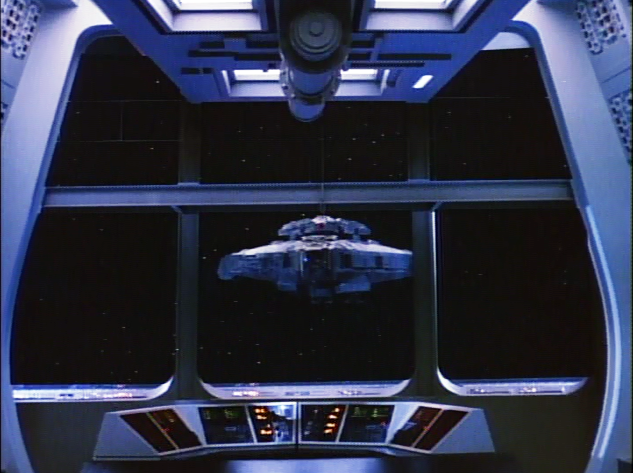 “Dreadnought” also represents our goodbye to Robert Maxwell, a character who has been front and center in the V saga since the original mini-series. The TV series seems to have forgotten that he had two other young daughters other than Robin (Blair Tefkin), as well as his vocation as a scientist. In the series, he merely plays the doting, concerned “grandpa,” while asking another scientist, Juliet, for help understanding his grand-daughter. Maxwell’s final sacrifice is heroic, though one wonders why he couldn’t have remained with the series longer. No doubt it had to do with the exigencies of cold, hard, cash. As I noted above, V’s cast was already large, and in that light, Maxwell might have seemed like a less vital character than Mike, Ham, Julie, Elizabeth, Willie, Elias, Robin, or even Bates. But I will miss him. His sub-plot in the original V was very important because it involved the scapegoating of certain demographics in a fascist state. The series never gets back to that theme. Ask JKM a Question: Monsters (2010)? Collectible of the Week: Freddy Squish'Em! Ask JKM a Question: Scares or Social Critiques?